The Northern Territory Government recently announced a new $100 million public housing stimulus program which aims to further support local businesses and jobs in the construction industry. At just 17 years old, Torrenzo Washington has already completed his Interpreter Induction training and is an interpreter for the Aboriginal Interpreter Service (AIS). An original member and founder of Australia’s most iconic Indigenous band Yothu Yindi is among those to have been allocated housing in Yirrkala last month. 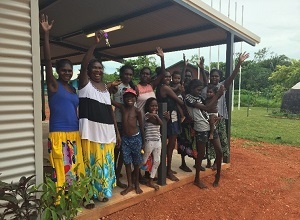 The Department of Local Government, Housing and Community Development recently funded a project in the Palmerston Indigenous Village (PIV) town camp. Have your say and help your community. It’s important for you, your family and your community to be enrolled to vote and to have your Medicare details up to date. Local government councils have the opportunity to apply for a one-off Energy Efficiency and Sustainability Grant. Are you looking for a low deposit home loan? Attend one of the information sessions being held in Darwin, Katherine, Palmerston and Alice Springs to find out more. The public housing complex at 47 Progress Drive, John Stokes Square, will be redeveloped in 2019. The $100 million public housing stimulus program is continuing to be rolled out across the Northern Territory.